It takes hours to get to Smith Mountain Lake, Virginia from Baltimore, Maryland. Four and half hours on a good day, and seven hours if you decide to leave anywhere between 3:00 pm and 6:00 pm on a Friday given that you have to drive through the DC mixing bowl (aka: hell) to get there. But I can’t sing its praises enough. Almost ten years ago, my grandparents bought a home on Smith Mountain Lake, and we have been going as a family ever since. Sure, the tiles are crumbling in the showers, there is always something for my husband to help fix or build, and we often just spend hours on the porch staring at the lake without actually going in to swim or Jet Ski. But there is an immediate sense of calm that washes over us as we walk through the doors. We wash off the car ride, grab a glass of whatever alcohol we have on hand, and slide the glass door out to the deck to get warm hugs and breathe in the fresh lake air. It was the biggest gift our grandparents could give us. The gift of being together. As for our last trip to Smith Mountain Lake, it wasn’t quite as relaxing. Most of us couldn’t reasonably ease in to the weekend for one reason or another, but we made the most of it by piling up on groceries and getting our hands dirty in the kitchen. Oh, the food we made! The most impressive being the fontina stuffed arancini (these will be on the blog soon) that we literally gorged on (immediately followed by lactaid). And an extremely impressive stone fruit sangria that we couldn’t stop drinking. And I got to spend quality time with one of my favorite people, my cousin Lauren, who is becoming quite the talented cook. Lauren is from my father’s side of the family, so this immediately means two things. One: she is going to be a good cook whether she knows it yet or not. Two: she loves food. She brought a cheap (albeit delicious) pinot grigio to make sangria, and when we saw a delicious assortment of summer stone fruits at the market, we knew exactly what to do. Ripe peaches, nectarines, apricots, and plums are simply diced and allowed to macerate in simple syrup and mint for an hour or so before pouring in the cold pinot grigio and a splash of pineapple rum. 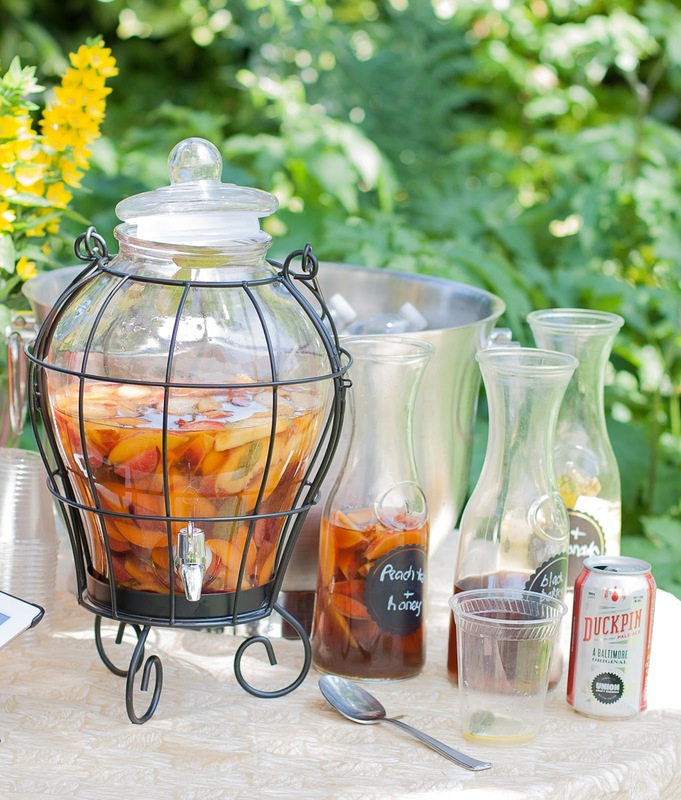 The end result is a peachy, light, sweet, and refreshing sangria that is really hard to beat. This could win awards, my friends. In a large cold beverage container or drink dispenser, add all of the diced stone fruits, cooled simple syrup, and mint; stir to combine. Allow the fruit to macerate for 30 minutes, up to 1 hour. Add chilled pinot grigio and rum; stir to combine. 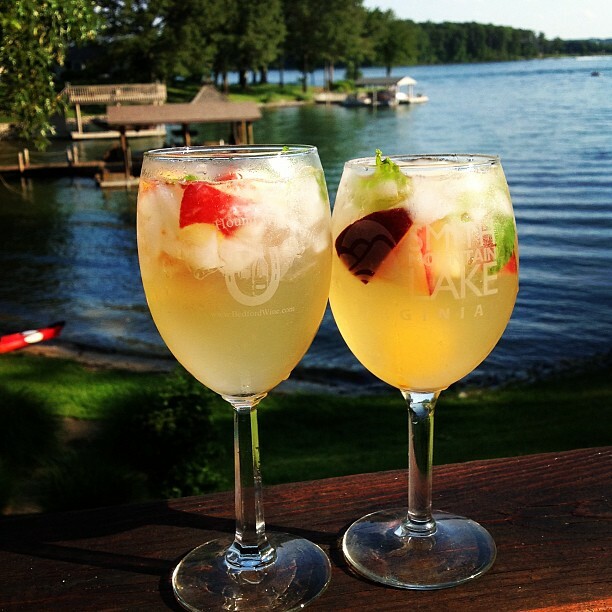 Serve on ice with a few of the diced fruits in the glass and a sprig of mint. Wow that sounds delicious! Definitely want to give this a try, perfect summer beverage :) Make sure you stop by my link party and share your facebook page! Oh. This looks perfect. So different from my father's old sangria, but so refreshing. The perfect summer drink - and I firmly believe one should never use expensive wine to make sangria, so that pinot gri sounds like just the thing!